Who decides what the university invests in? When I sat in Teviot debating hall three years ago as one of the students asking the students’ association to join the campaign to push the University to divest from fossil fuels and arms companies I never thought I’d be sitting in a management building three years later after continual refusals to divest. A couple of days ago the University of Edinburgh made the cowardly decision to not withdraw it’s £291 million endowment fund from fossil fuels and to instead keep funding climate change. Our University claims itself to be a world leader in sustainability but they have now clearly proved this is not the case. We’re going to find our existence utterly altered if we continue to extract and burn fossil fuels. Divesting is a way of taking on the big fossil fuel companies and the power they hold over our public institutions. We rightly condemn companies that don’t pay their taxes or who exploit their workers and so we must do this to the companies who are threatening our very existence. The only reason our society is currently so dependent on fossil fuels is because that’s what was (and still is) invested in decades ago. The University needs to invest in alternatives so we’re ready to replace this dirty and unhealthy energy source. These alternatives need to be planning and creating new jobs so that when fossil fuel industries cease to exist there is something to replace them and that our students are trained to work in it. Throughout the campaign I’ve been amazed by the constant stream of support from students, staff, alumni and the wider community. With lobbying happening both within and outside the boardroom this campaign has been diverse and been very clear on its demands. Even before this campaign, back in 2002, we saw early day motions lodged in both parliaments calling on the university to cease investing in companies which “flout human rights, exploit workers, pollute heavily or irresponsibly sell armaments” but due to the University’s inaction this could have equally been lodged yesterday. There’s been hours and hours spent talking to students, gathering thousands of signatures, holding stunts on our campus and submitting papers to board meetings and yet the University have done nothing. When human rights charity Reprieve got involved last year we saw our first big win with the University withdrawing its investments from UltraElectronics (a company which makes parts for drones which were being sent to Pakistan). Following this we persuaded the University to run an all student and staff consultation on what they wished the University investments to look like. This not only provided an extra piece of support for our campaign but proved that the University’s own research produced the same result as ours- a vast majority in favour of divestment .Yet still the University refused to change their investment policy. Since then the University have conducted the whole process behind closed doors and, until the day of their announcement, had refused to publish any of their internal recommendations or working group reports. The University and its fund managers have focused on a policy of engagement for years but in that time we’ve seen no positive outcomes and BP have reduced their research and funding in renewable energy. We’ve spent over three years lobbying and negotiating with the University but it has yielded no results. They have rejected and ignored the clear consensus on this issue and so the time for negotiation is over. Divestment is also about creating more democratic institutions where those who make up the University can have a say in how their money is spent and invested. This lack of commitment has shown that we still have a long way to go in achieving a transparent, democratic and ethical University. So, after shutting us out of the decision we’re now firmly shutting ourselves inside. We’re no longer being shunned and ignored by the University. We will meet with management but on our terms, in a space we have reclaimed from them to make them reconsider the purpose of the University – to make them put principles before profit. Our University is fundamentally failing to acknowledge the part they are playing in funding climate chaos and instead are speeding up environmental degradation. What we hoped would be the end of our campaign is now to be only the beginning and our campaigning is going to get louder and louder until the University stop burying their money in unethical companies and head in the sand. I am tired. In the sleepless, exasperated, jaded and honestly angry way, I am tired. I joined People and Planet looking to bolster the tail end of a successful three year campaign for divestment, but was only met with vague half-promises on the part of the University of Edinburgh. The narrative on the part of the university has been one of time and patience; the time for that has passed. Last year New Zealand accepted the first climate change refugee, only after he and his family had lived in the country for seven years. Despite the profoundly immoral nature of an economic valuation of climate change, the University continues to assure us that the developing world needs fossil fuels in order to develop. I would challenge Charlie Jeffery, senior vice-principal of the university, to inform the thousands living on low-lying island nations whose fields will lay salted and fallow, whose families will go hungry, whose homeland will be obliterated by climate change that this is the answer. All too quickly, Mr. Jeffery, the investment board and court full of bankers, and the usual bureaucratic suspects have dismissed divestment as ‘not in the university’s best interests’. In continuing to invest in fossil fuels, we are rapidly approaching a climate genocide in which, regardless of the level to which we address our cognitive dissonance, we will all be complicit. The unfortunate reality is that we are born into a commodified lifestyle. This can change. 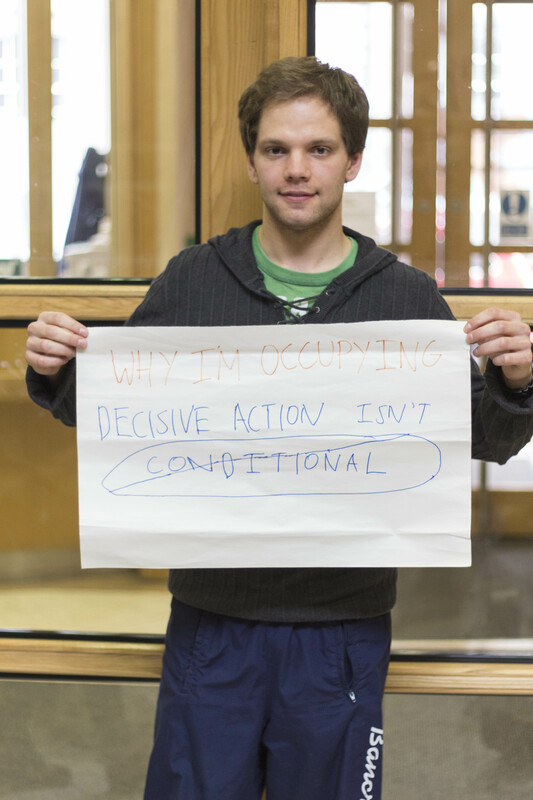 In my time occupying the Charles Stewart House at the University of Edinburgh, I have been deeply inspired by my peers and by members of staff who persist in supporting the cause of divestment despite facing pressure not to from the University. In our day to day meetings and consensus based decision making, I recall the words of the German philosopher Gustav Landauer who said, ‘The State is a condition, a certain relationship among human beings, a mode of behaviour, we [change] it by contracting other relationships, by behaving differently toward one and other… We are the State and continue to be the State until we have created the institutions that form a real community.’ We are rapidly approaching the tipping point of climate change but we still only just have time to change. If we view the earth as a condition, as an entity with which we can have a sustainable and healthy relationship starting with divestment, we still have time to contract other relationships, to behave differently, to create institutions that form the new community. Join us, occupy the planet. The students of Edinburgh University have settled their beds in the university’s finance department to voice their outrage over the court’s decision to maintain investment in fossil fuels. After three years campaigning, the students are still battling to have their voices heard and now they’re taking action. 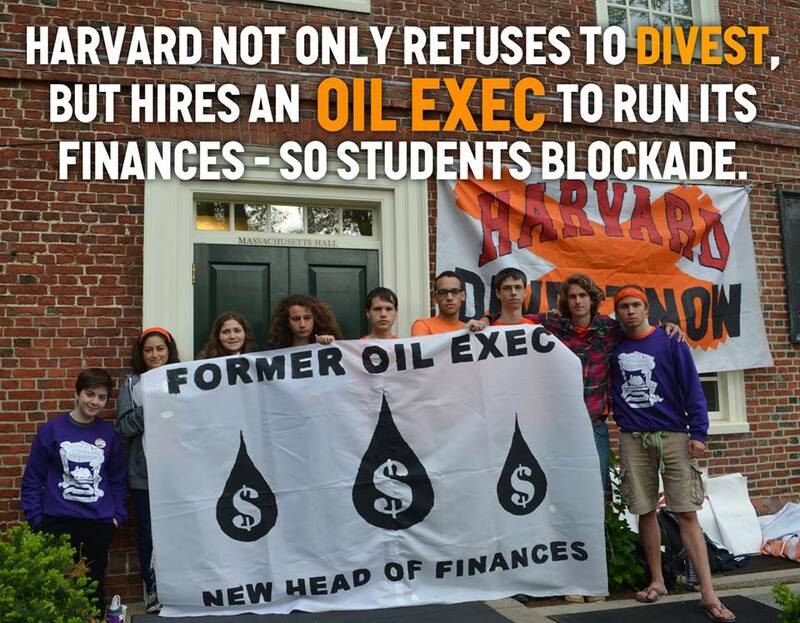 Divest Harvard are piling on the pressure to protest their University’s continued refusal to divest. Yesterday over 25 students blockaded the President’s office, risking arrest to disrupt until the University shows signs of change. Solidarity Harvard! Nice work, you are an inspiration. From Iowa: You guys are great!!! Brave, heroic, intelligent, and morally in the right! We from the Climate Reality Project stand firmly behind you as does much of the world. Thank you! You are making such a difference! From New York: Thanks for taking a stand for the climate! I support you from New York. 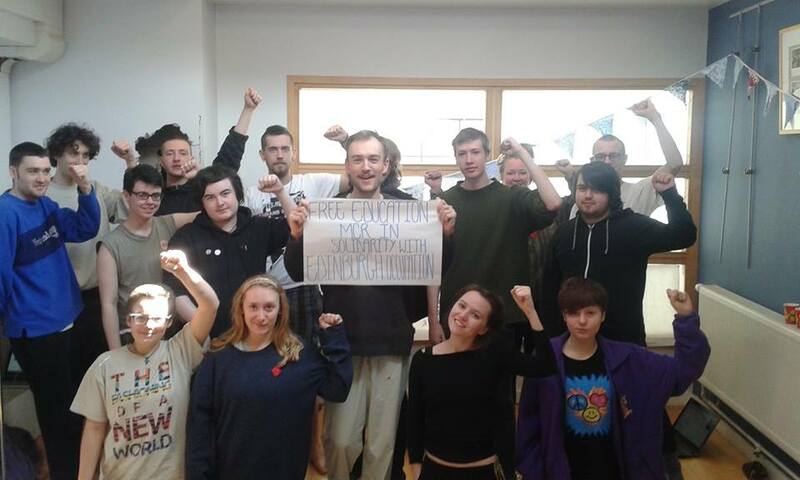 From Healthy Planet UK: A whole load of love & solidarity from UK health students & workers! 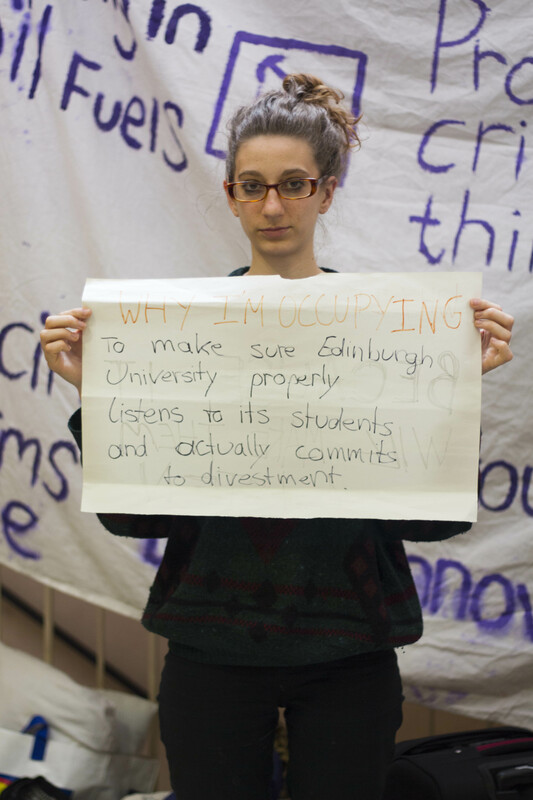 On the 12th of May Edinburgh University Court decided against committing to divestment. Fossil Free Warwick expresses solidarity with our comrades at Edinburgh who are currently in occupation in reaction to the University’s decision. This case unfortunately is an all-too familiar example of universities, public universities, placing profit before environmentally sound policy. Edinburgh will take divestment decisions on a case by case basis, only divesting in companies who currently have feasible alternative sources of energy. This completely negates the principle of fossil fuel divestment, which is a desire to explicitly remove the social licence of fossil fuel burning companies to operate within society; a policy which is becoming ever more a necessity given the perilous position of our environment. Edinburgh’s escalation is not an isolated case. They have shown, alongside recent action by students at Harvard, that the fossil free movement is now not satisfied with empty promises of ineffectual change. Universities are perpetually straying into hypocrisy by funding world-leading environmental research, while shunning calls for an ethically responsible investment portfolio. It appears as if attempts to delay critical decisions, or even worse, imparting an inconsistent environmental agenda, are considered appropriate for handling fossil free campaigns. This is frankly naïve. Students across the UK are willing to escalate in the fight for a fossil free university system, and a fossil free society. Solidarity Edinburgh P&P! 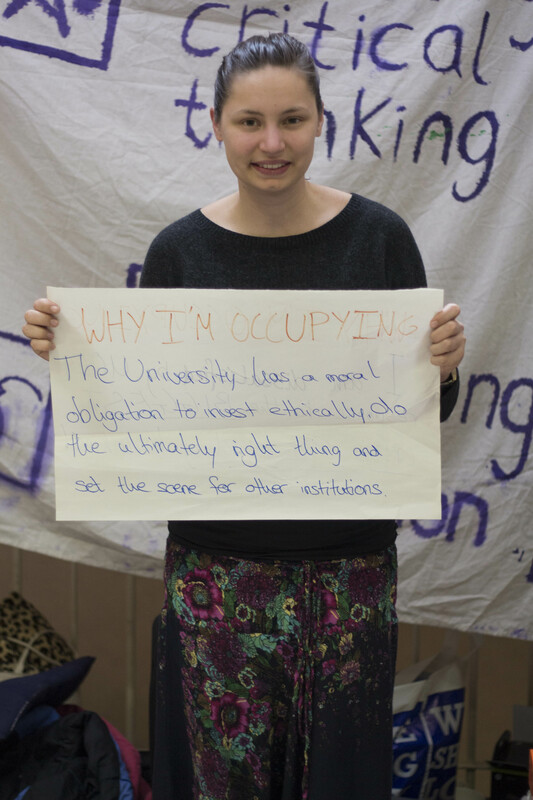 …And a shout-out to Free Education MCR who have been in occupation since yesterday in reaction to education cuts! 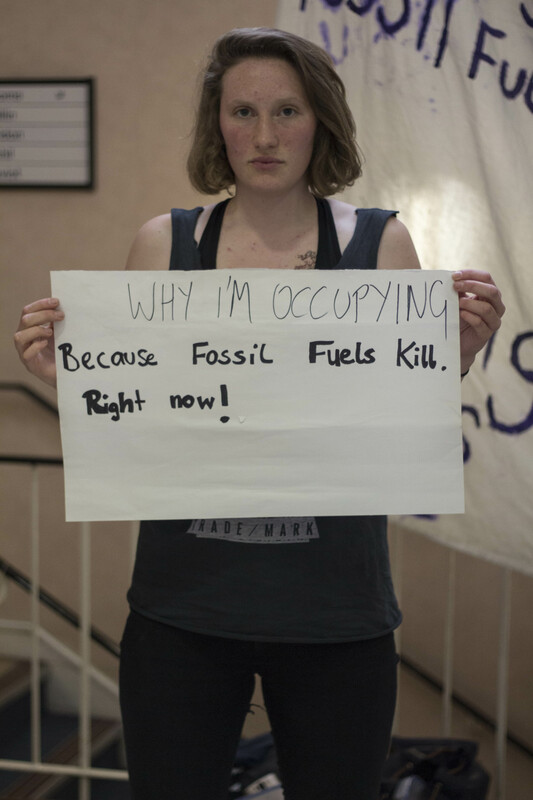 The University’s refusal to divest from fossil fuels is yet another demonstration of their continued prioritisation of profit over the concerns of students, staff, and the wider community. In their decision to continue investing in the fossil fuel industry, the University Court stand high on their privileged platform and ignore the millions across the world who will suffer the most from climate catastrophe. 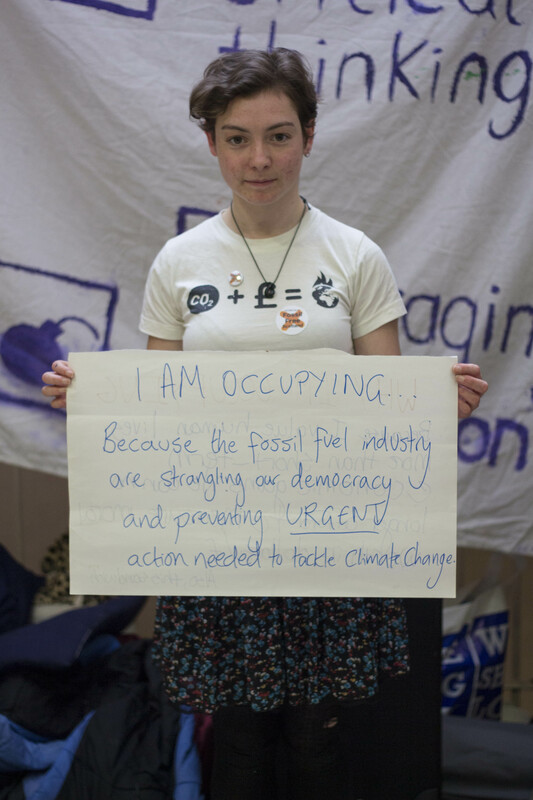 We need urgent commitment to full divestment. Instead, the decision of the University Court, as emailed to all students on Monday, was a weak half-hearted statement centred on a commitment “to work with companies to reduce their emissions”. This is fundamentally flawed. Engaging with companies, continuing to finance the destructive practices of coal and tar sands companies under the pretence that improvement is possible is not good enough. Negotiating with Shell won’t mean that they stop extracting fossil fuels even if they do invest in the odd solar panel; the University should not be able to use ‘engagement’ as an excuse for avoiding taking a decisive political action. We’re here in the hope that our immediate demands – that the University must commit to unconditional divestment from coal and tar sands – will be met. 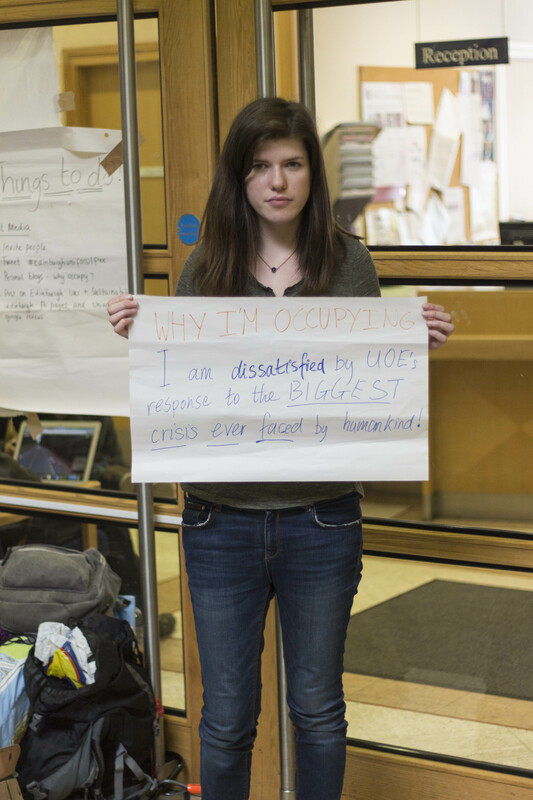 The University must use its power productively and add its voice to the global call to divestment. The campaign for full divestment from fossil fuels and arms will continue should this compromised demand be met. 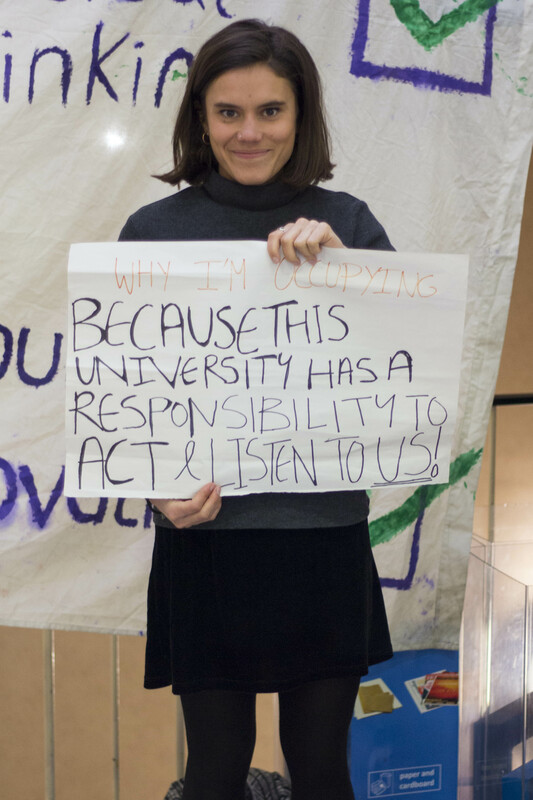 Show your support to the occupation by emailing (principal@ed.ac.uk)/shouting/sharing/letting the university know as publicly as possible that this fight is not going to fade until they make a commitment to divest from the toxic world of fossil fuels. -We demand that nobody involved in the occupation be subject to any subsequent penalisation for their involvement in the occupation. -We demand full disclosure on the court’s decision-making process, that is, a description of how the decision was made and clarification on what the decision actually entails. -We demand, as Edinburgh People and Planet, to have representatives present during all future discussion regarding ethical investment, and establishing parameters for what the University expects to achieve through engagement with fossil fuel companies. We have just occupied one of the main University management buildings -Charles Stewart House – as we’re thoroughly disappointed with the University’s failure to commit to divestment from fossil fuels. Edinburgh came down firmly on the side of short-term economic interest, with little to no acknowledgement of the long-term repercussions of their investments. 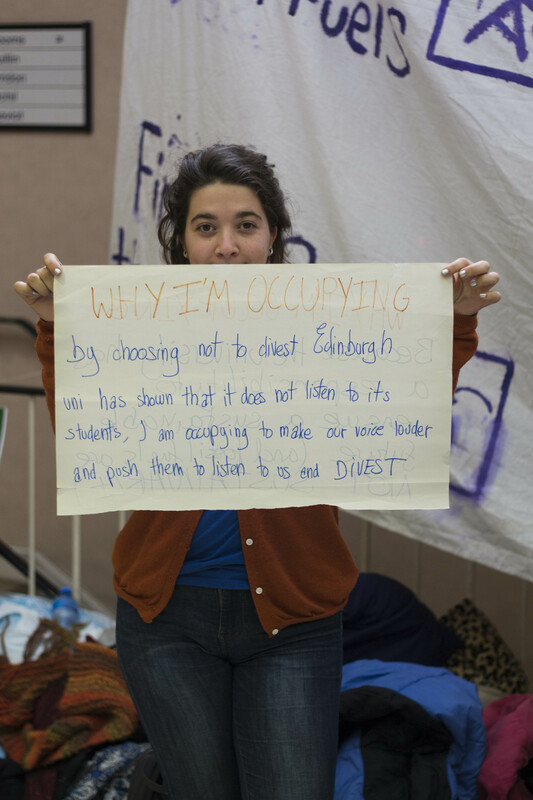 * The University of Edinburgh have not committed to divestment. * The process surrounding the decision to not divest has been extremely un-transparent. 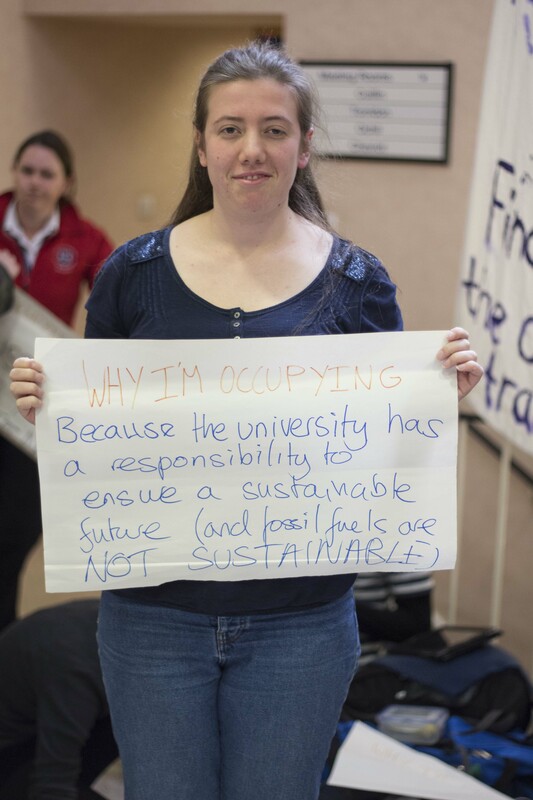 * The decision not to divest has been contrary to the will of students and staff. * The process surrounding the decision to not divest has not delivered any immediate results. * People and Planet, the initiators of the campaign, have been excluded from all working group meetings and announcements. * We’ve had three years of debate and empty promises, the time for action is yesterday. Yesterday the University of Edinburgh failed to make any commitment to the staff and students, who for the past three years have demanded divestment. After failing to recognise our voice we therefore have decided to take matters into our own hands and up the campaign to make the University listen. 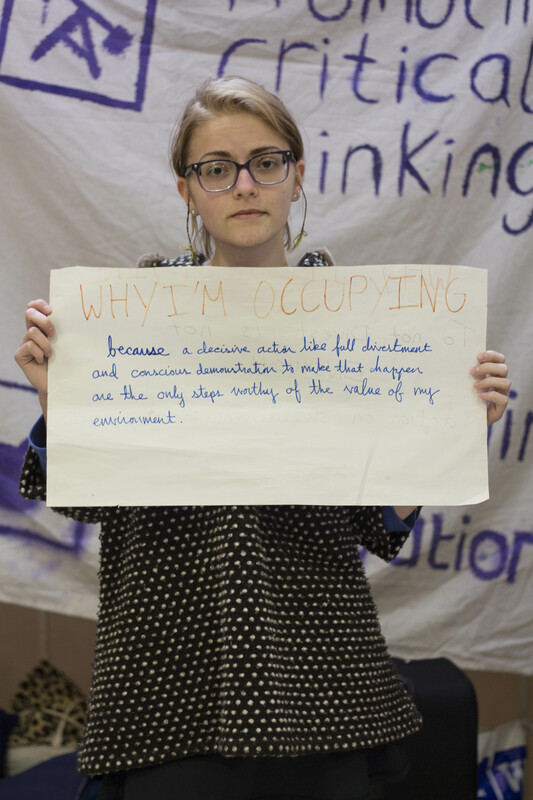 Our occupation will last until the University meets our original demands of committing to full divestment from all fossil fuels with them being totally screened out of the investment portfolio over a five year period. Yesterday the University Court claimed it would use the institution’s ‘leverage of [their] investments to bring about change that reduces carbon emissions in the fossil fuels and other sectors’. However, the proof against green-washing ‘engagement’ has been reiterated on countless different platforms. As Bill McKibbon states, ‘these companies are unlikely to engage in action that will put them out of business’, as is evidenced by BP’s recent decision to pull out of renewables. 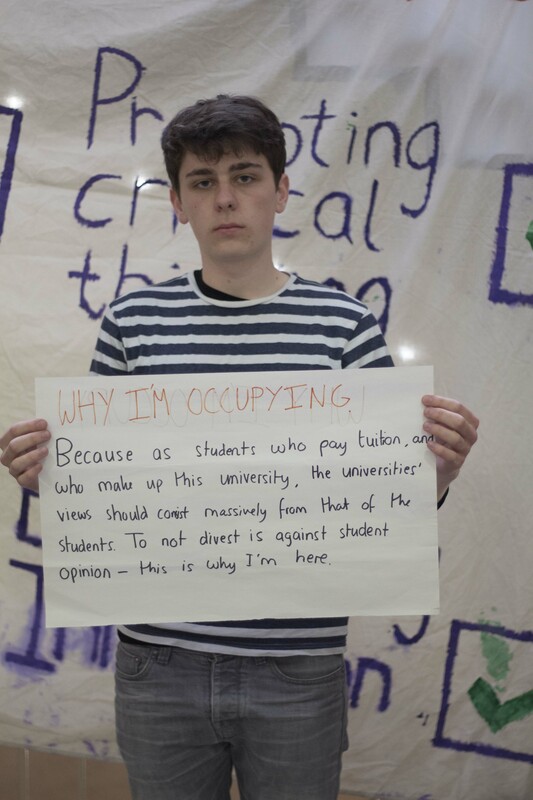 The fact is, if the University had an interest in changing behaviour it would have started at home by divesting. Divestment would have seen Edinburgh join a global campaign of universities and other forward-thinking organisations, which have divorced themselves from the grip of fossil fuel industries. In regards to the University’s investment policy, the official press release states, ‘The University will withdraw from investment in these [fossil fuel consuming and extracting] companies if: realistic alternative sources of energy are available and the companies involved are not investing in technologies that help address the effects of carbon emissions and climate change.’ Firstly, this wording is vague and leaves the option of no divestment open. Secondly, the reason there are no large-scale alternative energy sources is because of the failure to invest in them. 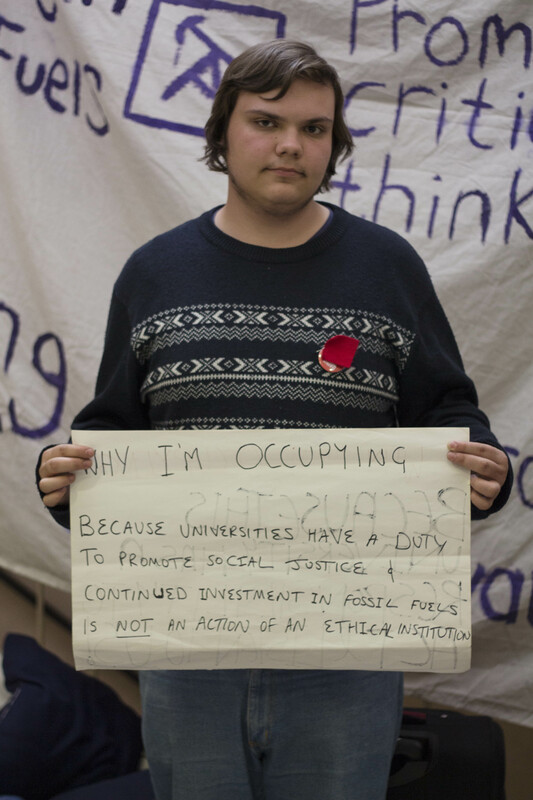 Despite a three-year process, it seems the university misunderstands divestment. Divestment does NOT mean a cessation in the use of fossil fuels immediately, instead it is about starting the shift from fossil fuels to a renewable economy. 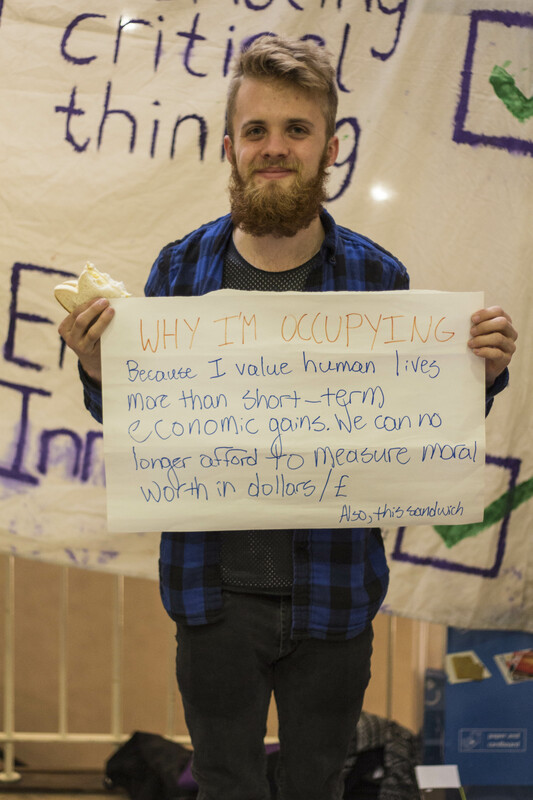 Divestment is designed to create space for alternatives to grow. This non-decision brings into question the validity of the University’s decision-making process. This process began after students voted in favour of the policy in 2012 followed by student representatives starting to raise the issue in board meetings. In 2014 the University ran their own consultation which found staff, students and the public in favour of ethical investment. A year after their consultation we still have zero commitment to change. The University refused to issue their working group report until yesterday and refused student’s entry into the press conference where the decision was announced. At the most important stage, they neglected their responsibility to students. So we’re not taking it any more, we’re occupying to make a firm stand that the campaign will not be going anywhere until the University commits to fully divest and we will be ignored no longer. Please explore our site to learn more about investments at Edinburgh uni - and about our campaign to clean them up. We are currently collecting signatures for a petition to demand change - please sign this! All material on this site (unless otherwise stated) is available to use or adapt under a creative commons licence for anyone campaigning for a greener and weapons-free world.